Rahul Dravid: What has the GenNext learnt from Rahul Dravid? What has the GenNext learnt from Rahul Dravid? I was 20 or 21. He was playing for Karnataka against Saurashtra in Rajkot. He is one of my idols. I just wanted to ask him that if I wanted to play at the international level, what should I do and how can I improve myself. He was very happy to talk to me. He was very friendly. He told me he had heard a lot about me scoring in domestic cricket and he was really impressed with that. When you hear from a big player, that he has heard a bit about you, it is very nice. After that, he gave me a few tips about succeeding at the top level. If it is similar to your game, it is easier to communicate and even he can understand my mentality, what I am thinking and how I can improve. Because he has gone through this stage many years back, he can understand a youngster's psychology. 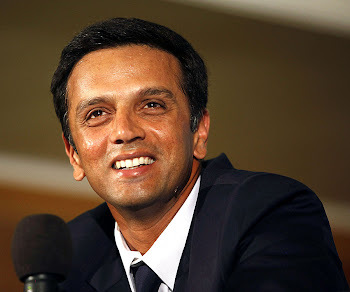 (One thing you would take from Dravid's game) I would say his positive attitude towards the game. A bowler has to work really hard to get his wicket. That quality I admire a lot because even I don't like to get out. In the Durban Test, I played a pull shot and got out. He saw that and when I asked him what went wrong, he told me to play my normal game. He had seen me play in the Ranji Trophy and said that normally you don't play those kinds of shots. "It is not your strength. You should play to your strength. The ball was skidding off the wicket and the bounce was so high you can't control the shot." He showed us how important your wicket is and to value it always. Another thing about him is how humble he always is on and off the field. That quality really stands out. I had made 165 and 98 in the 2008-09 Duleep Trophy final in Chennai against South Zone. He [Dravid] was part of that side. I wanted to go and ask him about my batting but was feeling hesitant about approaching such a big player. Instead, he himself came up to me and told me that I was doing well and needed to continue playing the way I had been playing. He also told me that I belonged to the international level and would play for India soon. He asked me to develop more confidence in my batting which is so important at the highest level. To have my idol, who I had grown up watching, reposing so much faith in me was a huge thing. I have had the privilege of sharing two dressing rooms with him - India and Rajasthan Royals. He is a very, very meticulous man. He is very careful about all the cricketing gear in his kit bag. It is all in order. It is never out of place. I saw it when I started playing alongside Dravid. He was just next to me and you could see all the pairs of gloves arranged neatly in one row. You could see the bats in one corner. You would never see things out of place. He is a man of order, I think. He is known for his professionalism and his ethics so it comes alongside his character. There was one game where the ball flicked his shoelaces and he got out in England. You could notice the next day that he had changed his shoelaces and tucked them in deep. When you say that the man leaves nothing to chance, that is the biggest example of that. He has definitely been very approachable. He is known to be a very quiet man but once you approach him, once you start talking to him, he keeps talking to you. [One thing you would take from Dravid's game] Temperament. Ability to fight it out in the middle. Ability to prove to himself and to others that he can do it and he can do it outside the country. I think the biggest example would have been the tours of West Indies and England where he got four hundreds in seven Tests. The ability to prove people wrong again and again. I've learnt quite a lot from him. The first thing is putting a price on your wicket. Secondly, no matter what condition and situation you are batting in, never give up. Just be there, feel the heat, feel the pressure. That is when your true character shows. He showed us that. That is the biggest thing I learnt from him. Rohit Sharma learnt about putting a price on his wicket from Rahul? Really?? I wonder what in what currency Rohit plans to put a price on his wicket...must be that of Somalia.